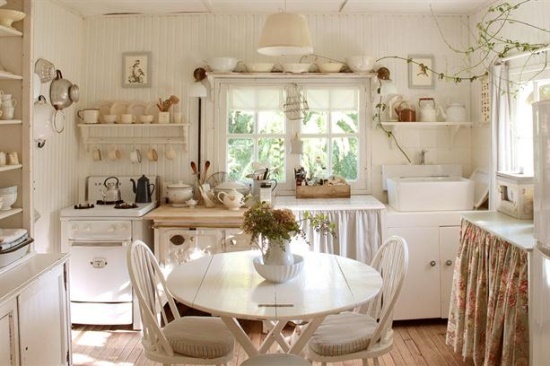 Who doesn’t love a great Farmhouse Kitchen…a homey place to gather for meals…preparing specialties to preserve…baking a yummy apple pie and everything in between. 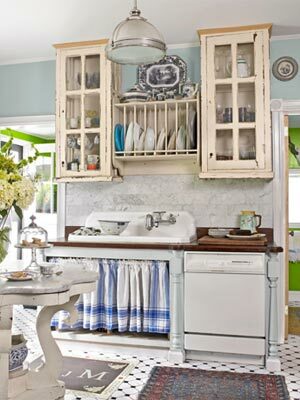 Well “they say” that the “homey” kitchen is part of the decor trend in 2013. 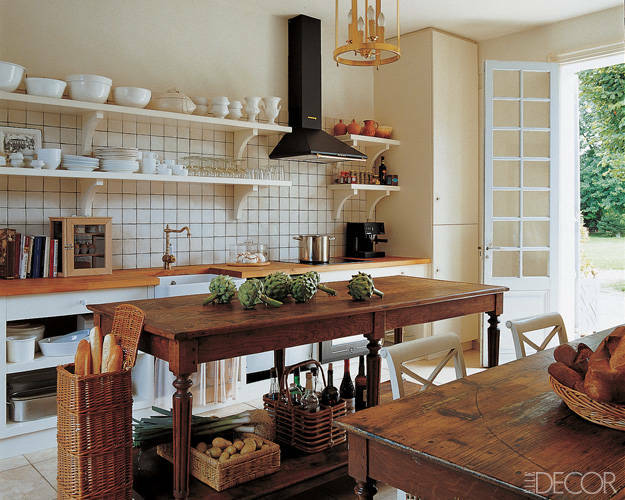 A kitchen that favors natural elements and is not as slick as some have been in the past. 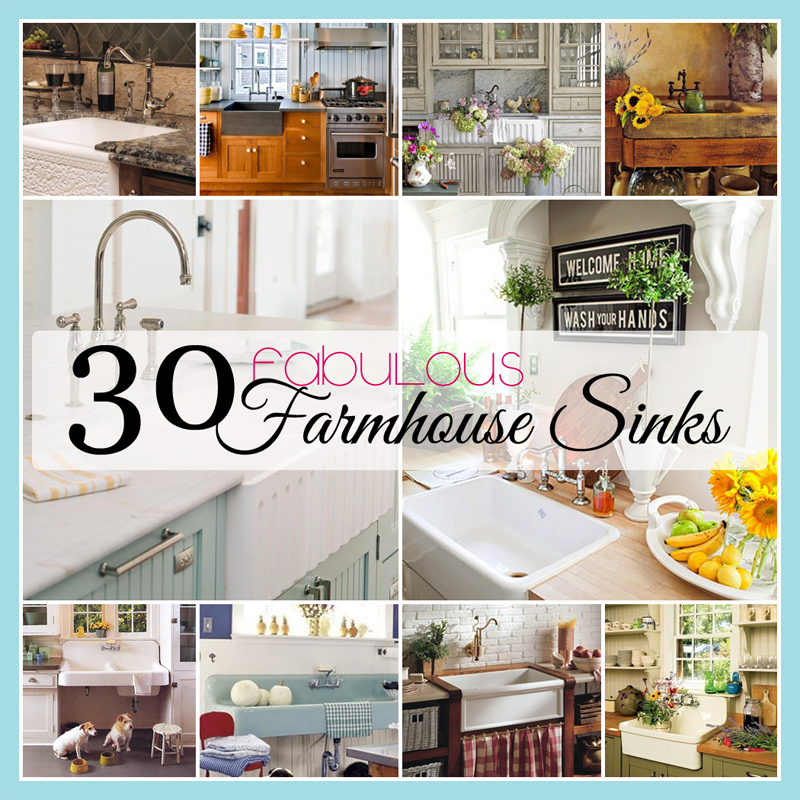 Let’s take a look at a few amazing Farmhouse kitchens as we enjoy a cup of something yummy. 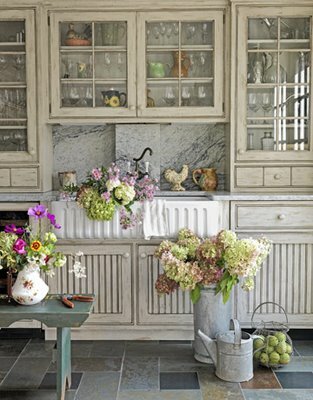 Today’s journey is not one of high tech kitchens…it is a glimpse into the homey cozy Farmhouse style that gets its glamor from natural elements. 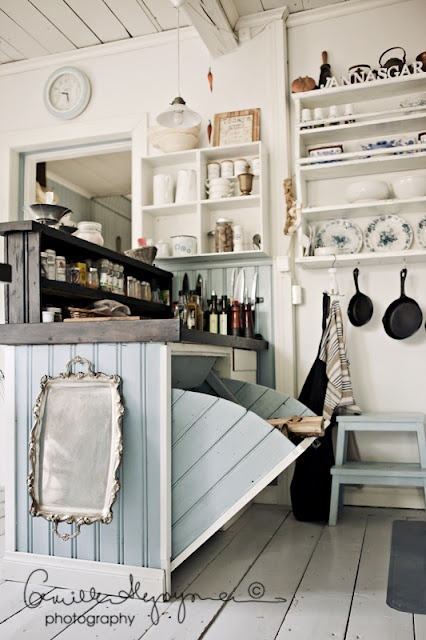 Not to worry…we will have many more adventures in Kitchenland…all kinds…all style…white to popping colors…so stay tuned! Designer Young Huh created this kitchen to recapture the spirit of a childhood kitchen using simple cabinets…an old pine table…natural wooden floors…soapstone counters and other natural elements. 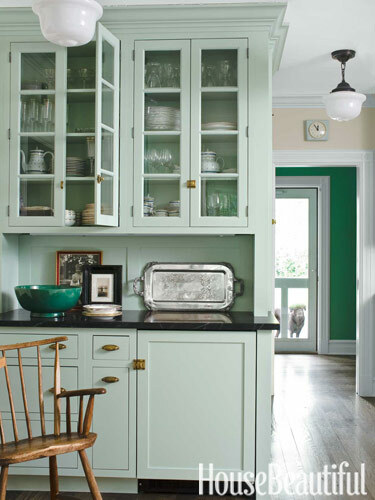 House Beautiful says that the “homey” kitchen is an “in” trend for this year and a fabulous one at that. You can read more about the whole design process by Young right here. A very interesting interview that I think you all might enjoy. Without further ado…here is the kitchen and it is magnificent new look…but a look that appears to have been there forever! Mission accomplished! 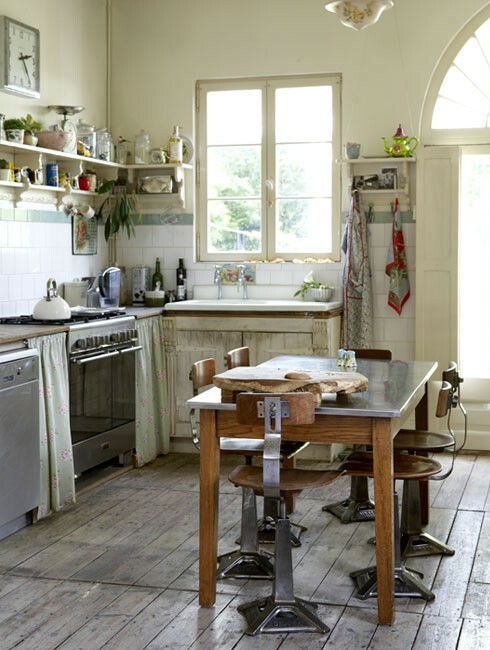 This comfy kitchen also uses many natural elements…the slate floor, wooden beams…butcher block counters and the heart of the room…the farmhouse table. Find out more about this beauty here. 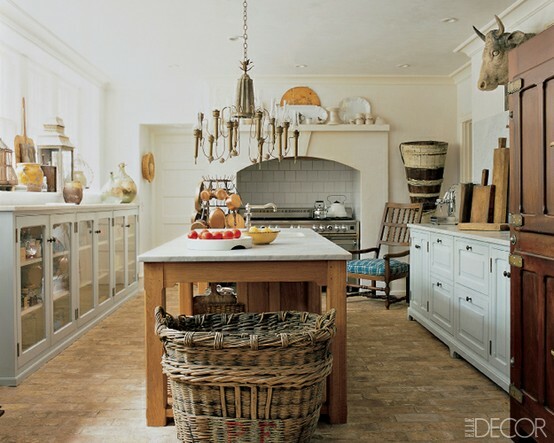 Glass cabinets, stone, tile flooring and lots of wood create a down home flavor. 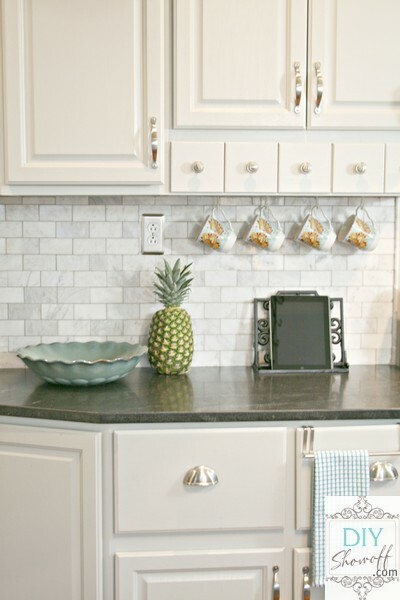 Tile is used as a back splash and of course I only have eyes for that stove! she brings in a touch of nature with the beautiful distressed wide plank antique java bamboo flooring and what about the two vintage desks forming the island…BRILLIANT! 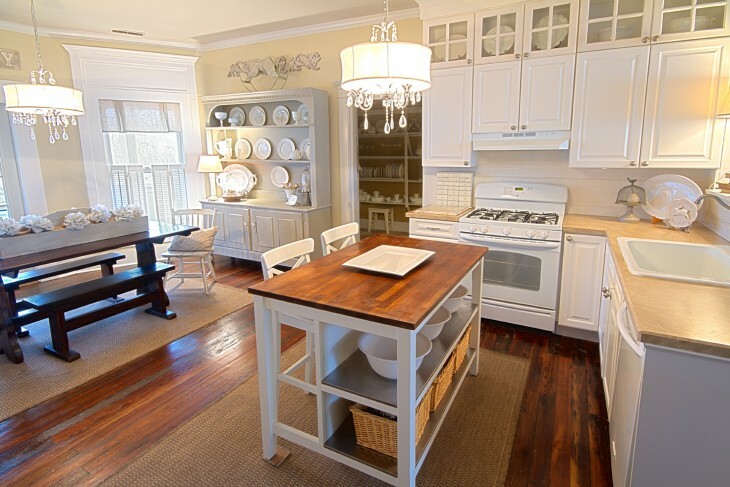 There is so much more to see…take a trip over and visit Roeshel she will take you on a wonderful tour throughout this kitchen…you will enjoy your visit. 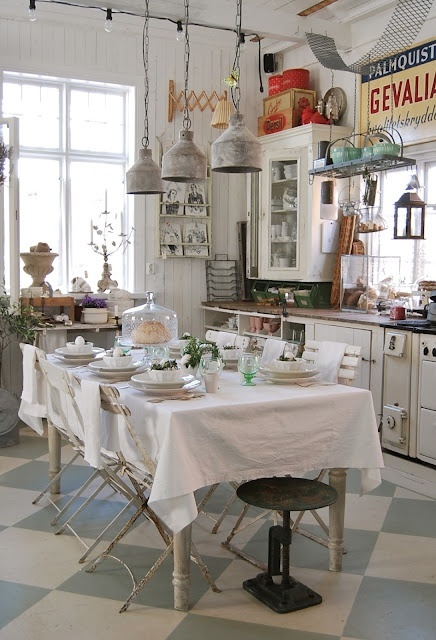 Take a peek at a touch of Scandinavian Farmhouse Kitchen Charm. 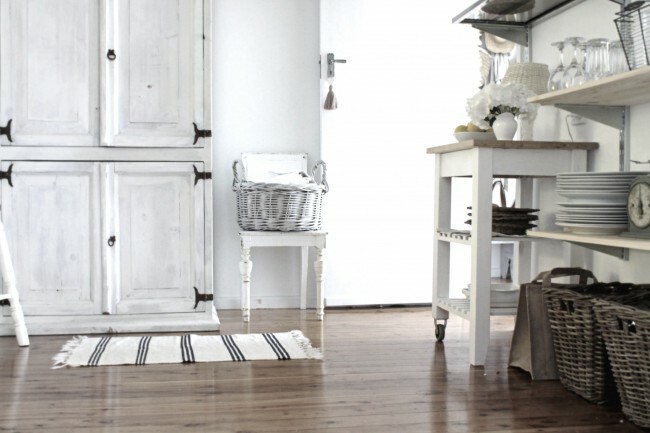 What a great space…beadboard bins…white washed wooden floors and then perfect vintage touches. Comfy cozy! Now if this doesn’t say Grandma and where’s the apple pie?…nothing does! 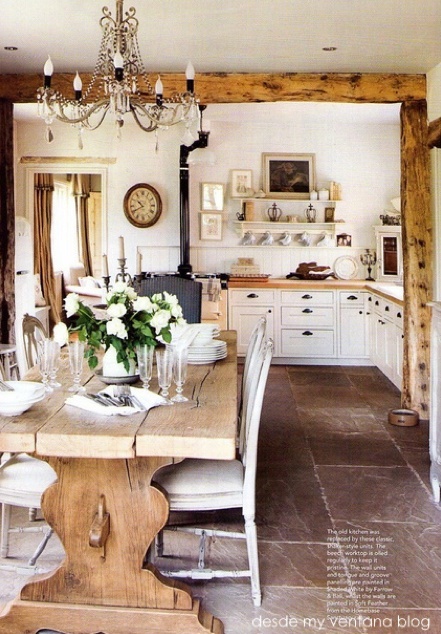 This farmhouse has hugged its whole space in white and the white washed vintage wooden table is still the shining star. 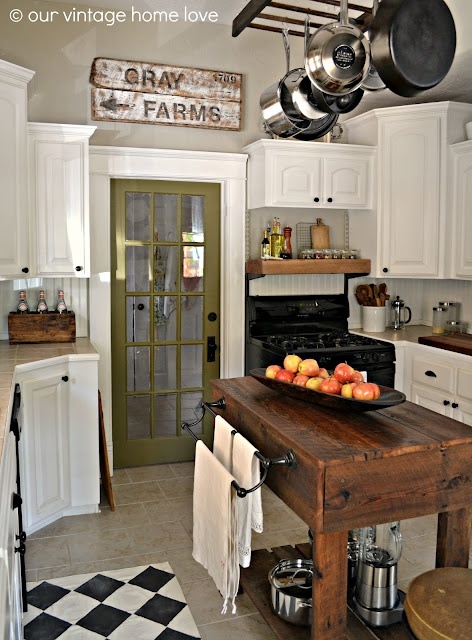 The flooring and counter tops are tile and slate…the island is a worn and glorious wood…even the sign is made from old re-purposed barn wood… all of these elements bring the loving farm flavor into this room. Eclectic Farmhouse style that is welcoming and cozy. 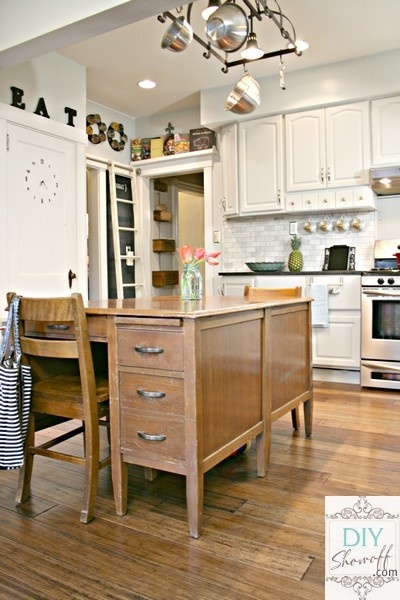 Wooden counter tops…a simple floor…vintage glass cabinets along with vintage “industrial” style lighting just makes you want to sit down and break bread with family and friends. 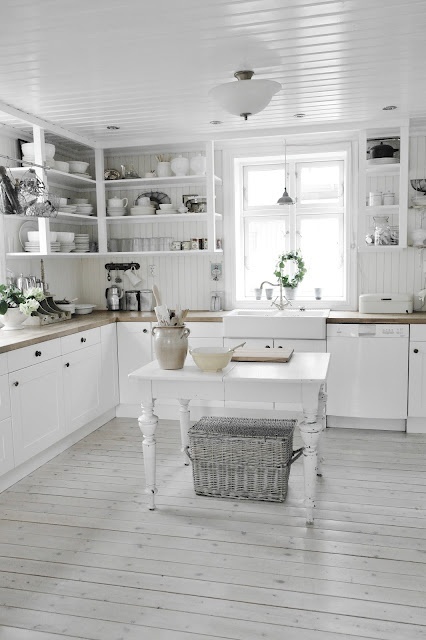 White washed and wonderful! 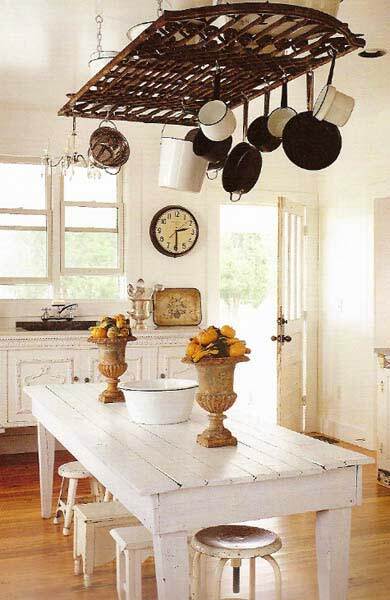 Simple cabinets…open shelf storage…wooden planked floors and ceilings and concrete counter tops along with a vintage farmhouse table and a touch of wicker give this kitchen a natural and beautiful glow. Nothing fancy but so much heart. Down home and loving. 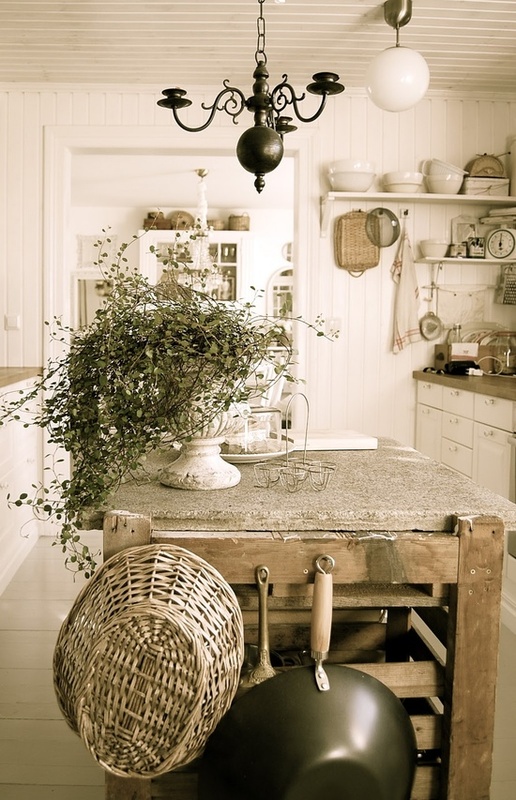 A simple kitchen again using natural elements…getting back to basics. So much style…tons of charm and a great use of vintage…wood…and even old feed sacks sewn into pillows. 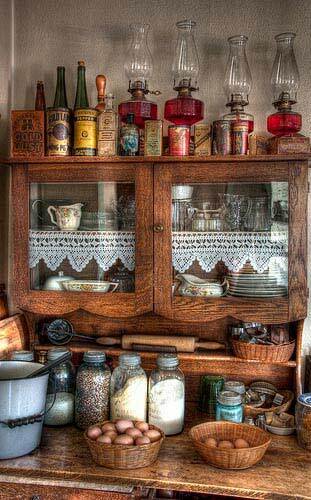 You can do so much with items that you have…things that you love…treasures that you find. A Beachy Farmhouse Kitchen is so much fun…here are just a few elements from this one…wood…wicker and vintage star once again. love it…so much more to see here. 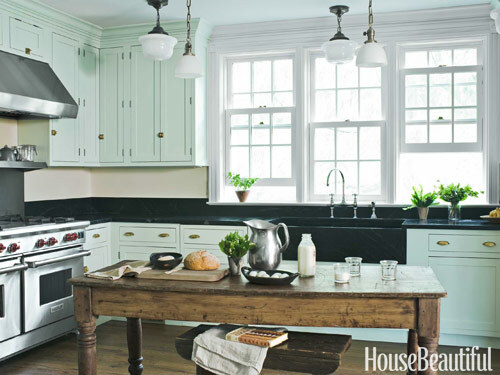 Aged wood…glass cabinets…beamed ceiling…slate flooring and wire bring this kitchen together with homey charm! Vintage black and white tiled floor…old glass door cabinets…wooden counter tops…farmhouse sink and a touch of cottage love with the little curtain sink skirt sets the tone of this special space. Concrete counter tops star in this kitchen. 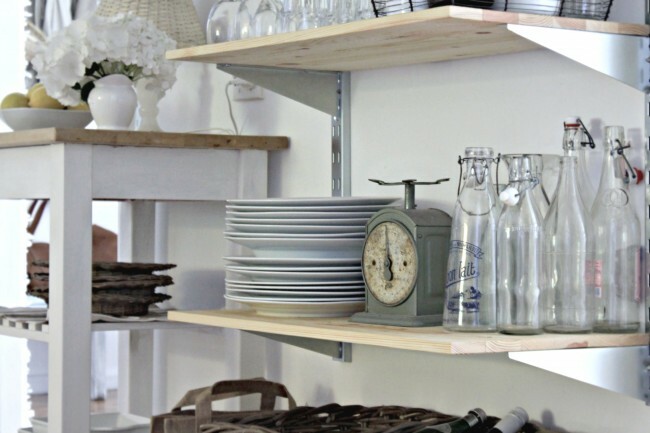 A great inexpensive natural element that doesn’t pinch the budget as some counter tops do…maybe it is in your kitchens future. A natural airy space brings a bit of the outside in…has all the modern accessories but a special touch of nature as well! 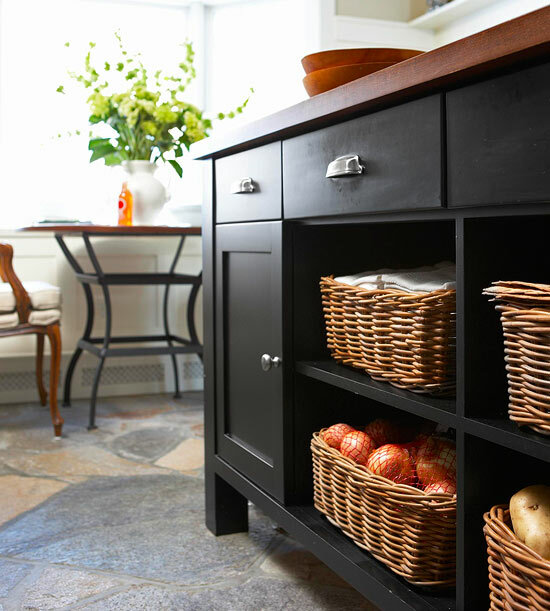 Wicker and irregular natural slate flooring is appearing all over in the 2013 “homey style” kitchens…nice touch to a farmhouse look don’t you think. Wood…marble…slate…glass…bring it together for any farmhouse style…such as this French Farmhouse look! this space has tons of natural elements and no…that is not a real cow head…if it was I wouldn’t be featuring this kitchen : ) this space is amazing! Drop by and she gives you the diy and a modern day folk tale on all of her decorating adventures. 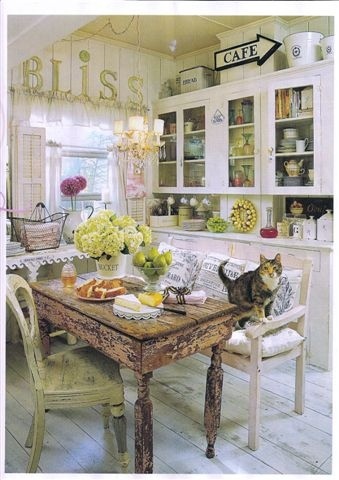 As you can see…simple lines…wonderful woods…natural elements and Kari’s impeccable style is every where! Enjoy her hospitality. 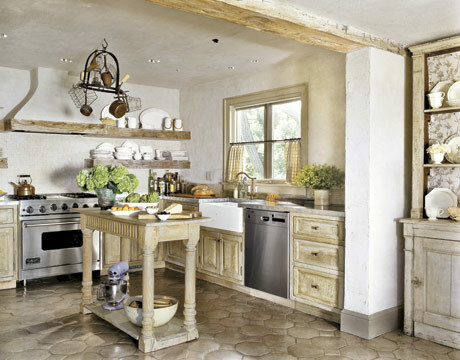 Another beauty from Elle Decor…recycled tile…glass…slate and wood just smile over this space. Did you just hear me sigh…oh how sweet and beautiful is this space…a breath of fresh air and could it be any more homey and charming? 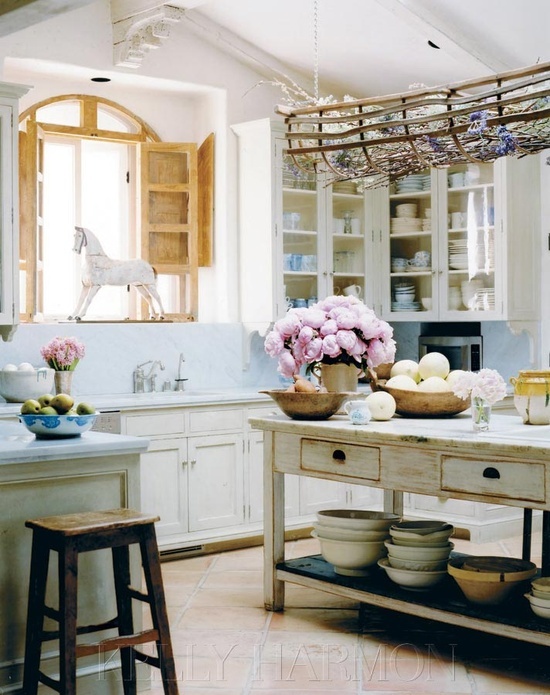 Wood..wicker…painted concrete counter tops…slate floor… glass cabinets…vintage and flowers…oh and that island…now if there is a powder blue pizza oven in here somewhere I think I will marry this kitchen! 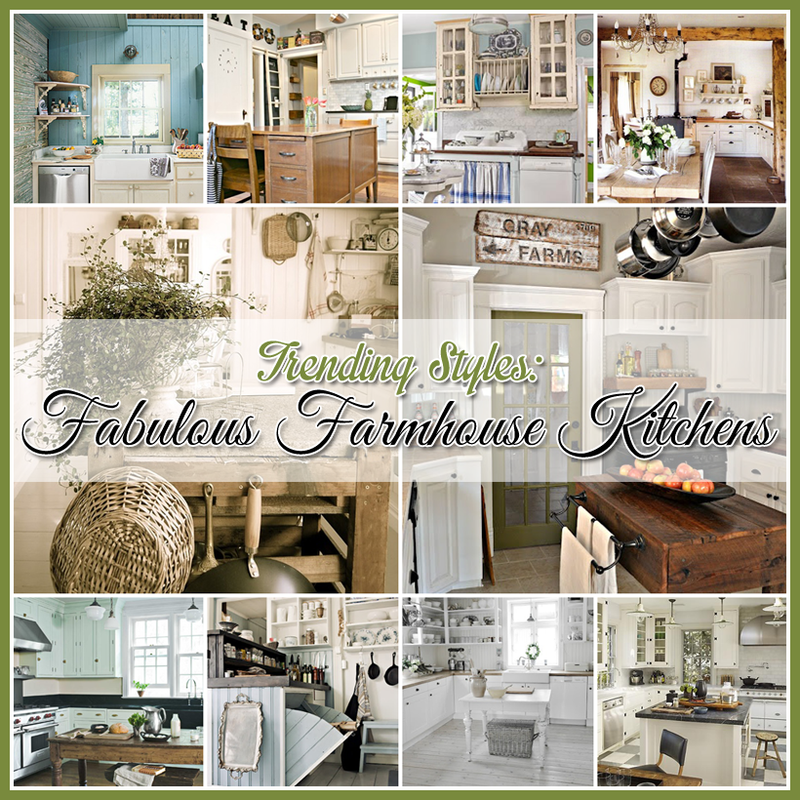 Well there you have it…a little trip through a variety of different style farmhouse kitchens with a natural flair! We will be exploring many more kitchen styles in the weeks and months to come so stay tuned! We will also be taking a look at some of the other “trending” styles for 2013…along with exploring colors…so keep an eye out! Wow wow wow. You are just the queen of collections! The absolute QUEEN! if i had a kitchen like one of these, i wonder if i would ever feed my family another strip of bacon or deep-fried goodies ever again. it’s nice to have lots of fun decor but you gotta factor in normal kitchen grease. We have finished up a 2+ year kitchen remodel/update~~a lot of the features in these kitchens is somewhat represented in mine. In a very upcycled, cheap way of course, lol! So I guess I had the right ideas~~anyway, LOVE all of these! 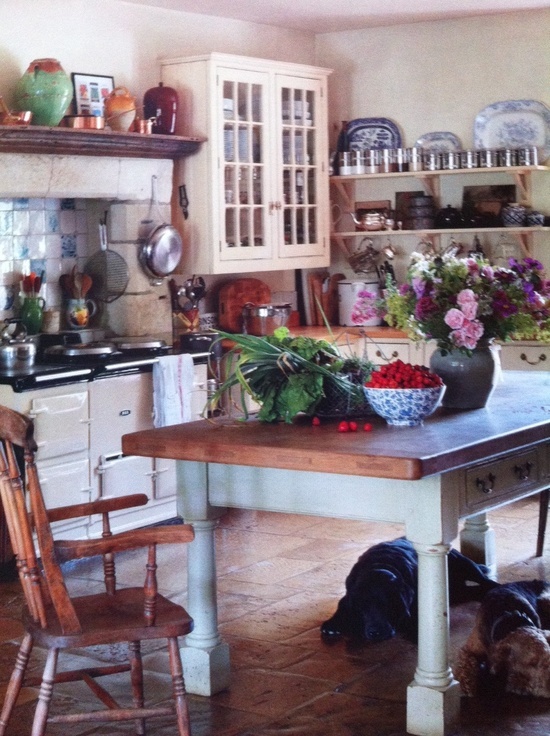 What beautiful pictures of farmhouse kitchens! I remember both my grandma & granny having similar styles, and what I wouldn’t give to have a house like that – instead of the brick matchbox one we have now! I dream of moving to one -one day!